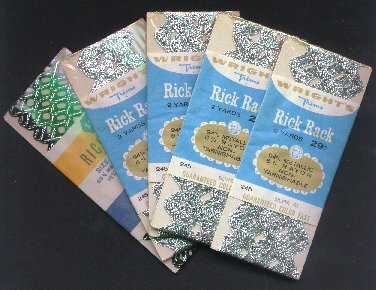 "Wright's Vintage Rick Rack - 5 unopened packages - Metallic." (1293) Wright's Vintage Rick Rack - 5 unopened packages - Metallic. - Condition: Very Good - Wonderful vintage Rick Rack in sealed packages. There are four packs of Metallic Silver Rick Rack and one pack of Black with Metallic Silver Accent. Price: $5.50 + shipping.